Mazembe are champions! The game finished 1-1 on the night in Rades meaning TP Mazembe of DR Congo become the first team ever to win back-to-back African titles twice. They have defended their crown from last year at the expense of an Esperance side which put up a good showing but which ultimately had too much to do from the first leg. TP Mazembe completed a successful defence of the Orange CAF Champions League after holding Tunisia’s Esperance to a 1-1 draw in the final second leg on Saturday at the November 7 Stadium in Rades near Tunis. Mazembe were winners in 1967 and 1968, and their successfully defence lands them a place in the in the historic books of African football with respect to the foremost club competition. The trial has started of eight officers charged with the murder of a prominent human rights activist in the Democratic Republic of Congo. 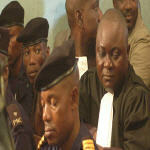 They are accused of killing Floribert Chebeya, head of the charity Voice of the Voiceless, in June. Esperance still harbour hopes of winning the African Champions League, despite a 5-0 deficit to TP Mazembe going into the second leg of the final. The game will be played in Rades, near Tunis, on Saturday evening. 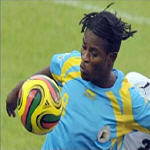 Mazembe, from DR Congo, are favourites to retain their continental title and qualify for the Fifa Club World Cup. The Confederation of African Football (CAF) on Saturday revealed the nominees for the 2010 Player of the Year award and 2010 African based Player of the Year award. The contenders for the African-based Player of the Year are: Ahmed Hassan (Al-Ahly and Egypt), Oussama Darragi (Esperance and Tunisia), Alain Kaluyituka Dioko (TP Mazembe and DR Congo), Michael Eneramo (Esperance and Nigeria) and Mohamed Nagy ‘Gedo’ (Al-Ahly and Egypt). Despite often severe adversities, many African countries have made often overlooked progress in recent decades. However, the Democratic Republic of the Congo, Zambia and Zimbabwe are the only countries with lower Human Development Index values today than in 1970, due to the deadly combination of conflict and AIDS driving down life expectancy. Esperance were no match for TP Mazembe of DR Congo who thrashed the Tunisians 5-0 in the first leg of the final of the Champions League on Sunday. 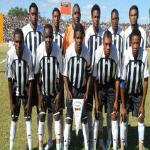 e emphatic victory in Lubumbashi kept alive TP Mazembe's hopes of retaining the title. 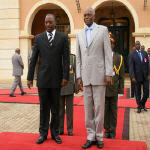 Angola's "very violent" expulsion of about 200 Democratic Republic of Congo nationals from its territory this month is a sign of the increasing "bad blood" between the neighbours that analysts believe revolves around border demarcations and conflicting claims to resources, particularly oil. Pope Benedict XVI has convoked a special consistory for the creation of 24 new cardinals. The Holy Father made the announcement at the end of his Wednesday audience. Speaking to over 40 thousand people in an autumnal St Peter’s Square, Pope Benedict announced the names of the 24 men whom he will elevate to the College of Cardinals on November 20 next. They include Mgr. 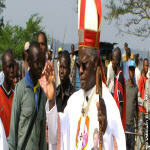 Laurent Monsengwo Pasinya, Archbishop of Kinshasa. 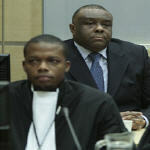 the Appeals Chamber of the International Criminal Court confirmed the decision of Trial Chamber III entitled “Decision on the Admissibility and Abuse of Process Challenges” and dismissed Mr Jean-Pierre Bemba Gombo’s appeal against this decision. This judgment confirms that the case against Mr Bemba is admissible.